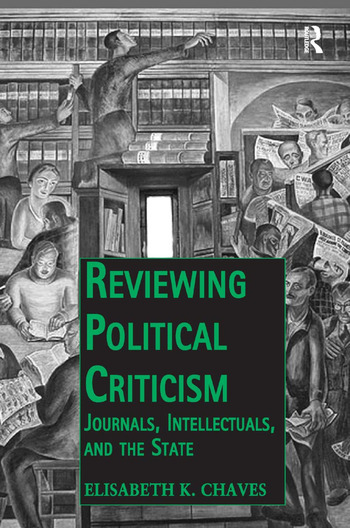 Reviewing Political Criticism examines the rise of the ’review’ form of journal publication, from the early eighteenth to the early twenty-first centuries. The review belongs to a long tradition of written political criticism that first advised, then revised, and with the increased confidence afforded to civil society by the rise of market capitalism, subsequently challenged and even transformed the state’s view on what and how it governed. Chaves investigates the crucial nexus of intellectual debate with political judgment over this time, and highlights the review’s central role in upholding this connection. Focusing upon critical moments that required the exercise of political judgment, the book explains this journal form as a means of political practice, one that essentially ’re-views’ the state’s view of how society should be ordered. To understand critical activity, one must reflect on where this activity takes place-on the institutions of criticism that sustain it. Referred to by some as the ’natural habitat’ of intellectuals, journals, as the institutionalized sites of theoretical discourse, are often overlooked. This groundbreaking book offers a concentrated critique of the review form of journal publication as a medium for political thought and action, as a decisive site for political judgment by the state’s conservers and critics. Elisabeth K. Chaves is a Visiting Assistant Professor in the School of Public and International Affairs at Virginia Tech, USA.